The U.S. continues to be a juggernaut of oil production. But there is a problem with our oil that no one is talking about. To understand the flaw in U.S. oil, we must understand its source. Most of the new oil production comes from shale rock. Shale is the source rock for conventional oil fields. The oil forms in it. However, the shale traps the oil in its tight layers. Fracking releases this oil by creating fractures in the rock. The oil and gas can flow through these cracks and into the well. The problem with the oil sourced from shale is in its density. Shale oil is “light and sweet.” That means it is thin (think vegetable oil) rather than molasses. And it doesn’t have much sulfur in it compared to the heavy crude oil coming out of places like Venezuela, Mexico and Saudi Arabia. Light and sweet oil may sound like a good thing, but too much can become a problem. Gasoline is the main product from light oil. U.S. refiners turn half a barrel of oil into gasoline. The rest goes into making diesel, jet fuel and heating oil. Growth from these other petroleum products is outpacing gasoline, causing stocks of light oil to build up faster than heavy oil. 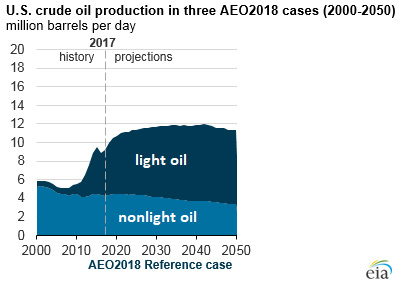 In the chart below, the Energy Information of America estimates the future production of U.S. light shale oil. The problem is that refiners in the U.S. can’t handle this much light oil. After decades of building refineries to handle heavy oil, this light oil has trouble finding a home. Producers have to sell at a discount to refiners in Europe and Asia. What they can’t sell ends up getting stored as extra inventory. Markets look at these inventories to predict the future price of oil. Because it takes time to work this new oil into the system, we end up with more than we need. But that doesn’t mean we don’t need the oil. The market misinterprets these higher volumes of oil as lower demand. But that’s not the case. Saudi Arabia and OPEC know this. That’s why they aren’t concerned about increases in U.S. production. It will take years before refiners move to processing more light oil. In the meantime, the price of heavy oil, like brent crude, will continue to climb despite increased U.S. production.